Directions for this route are very simple. 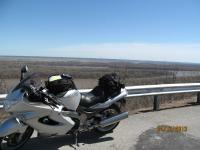 From Hannibal MO just take 79 south along the Mississippi river and all the way to Louisiana MO. This route hugs the banks of the Mississippi river and offers a very nice country setting with park like wooded areas and a couple spectacular vistas of the mighty Mississippi. Very well paved with light traffic and twisty. 35 and 45 mph signed turns abound. One of the best cycle roads I have EVER traveled!!! Its a short route 30 some miles and we were having too much fun to stop. There are plenty of amenities in Hannibal and at least 1 roadside scenic overlook along the way. Overall this isn't a road you take because of the things along the road ... you take it for the road and the scenery! on December 20, 2007 2 out of 2 members found this review useful. Take this route in reverce but start in Winfield Mo. Take Hwy 47 to Hwy W. Take W all the way to Clarksville Mo. to Hwy 79. Then finish your trip to Hannibal Mo. This will make for a great country ride. Spring and Fall are the best time to take this route. rode route 79 from hannibal to cape girardeau to ozark beach to banson and can tell all they are great rides, rode from northern illinois to going to the sun road and back 4950 miles and nothing is as beautiful as the mountain to the northwest that is the best riding area in the united states. on March 13, 2012 1 out of 1 members found this review useful. I agree with extending the ride a tad and doing what "George" mentioned; Hwy W (from Winfield to Clarksville) is a fun addition to this route. on November 20, 2010 1 out of 1 members found this review useful. Highway 79 between Hannibal and Louisana has been CLOSED because of the road landsliding near the salt river and will NOT reopen in 2011. I live in Hannibal and the proposed new route for the highway will lose some of the best milage. on December 31, 2014 0 out of 0 members found this review useful. From Hannibal to Louisiana is a great ride in itself, I extended this onto Elsberry and then to MO W, onto KK into Troy. Had a great ride that day. on September 8, 2013 0 out of 0 members found this review useful. Best short segment ride in this area. Twisty, hilly, great views of the river, interspersed with pleasant valleys and small farms. Very little traffic, roads are good but watch for gravel in the corners.